The Freemasons, an international organisation often shrouded in mystery, is undergoing a rebrand. But what is this society and what exactly do Freemasons do? Conspiracy theories and controversy have dogged the Freemasons throughout their existence, fuelled by their secretive image, but for some they are just a gentleman's club devoted to charitable giving. Nigel Brown, grand secretary of the United Grand Lodge of England has answered a selection of readers' questions. Anwar Nawab in Virginia, US, writes: Can people of other races besides Caucasian apply and become members too? 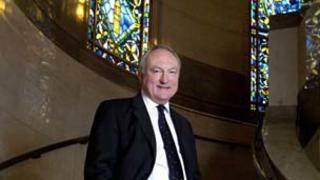 Nigel Brown: Any man over the age of 21 (or 18 in the case of University Lodges) can apply to join the Freemasons, regardless of race, colour, religion, political views or social or economic standing. It should also be noted that Freemasonry is a non-religious and non-political organisation, and discussion of politics and religion are forbidden at lodge meetings. Mohammed Kayani tweets: How can one become a member? Nigel Brown: Members can be recommended, or they can put themselves forward. There is detailed information about becoming a Freemason on the United Grand Lodge of England's website. If individuals don't know anyone who is a member, they can either contact a Masonic Office in their area, or contact the United Grand Lodge of England via the website. Nasiru Saadu in Abuja, Nigeria, emails: What does the one-eyed symbol on their flags signify? Nigel Brown: The symbol you are referring to is known as the All Seeing Eye. It is a reminder of the existence of a higher being. Amanda Luxton in Southend-on-Sea emails: Do magistrates have to declare their membership to the Masons, as well as other judges within the Ministry of Justice? Nigel Brown: No, none of them do and we are also working hard in other professions to stamp out discrimination. The European Court of Human Rights ruled in 2007 that in a modern democratic society it was discriminatory to single out Freemasons from the many voluntary organisations an individual can belong to and require them to register their membership with their employers. Ana Milena Gongora in Colombia writes: Which conspiracy theory do Freemasons feel most annoyed about or consider the most awkward? Nigel Brown: All conspiracy theories annoy us as they are just that - conspiracy with no truth or grounding. Part of the reason for our current activity is to dispel all the myths and conspiracy theories attached to Freemasonry. Geoff Sandham in Oxford emails: What is the point of being a Mason? Is it fun - like going to the pub with a group of friends or does it serve the individual in a wider context? and Igen in Warri, Nigeria, writes: What are the benefits for members who intend to join the society? Nigel Brown: There are many different reasons why people join the Freemasons - one of the main reasons is camaraderie. Many friendships made through Freemasonry endure for life, and lodge dinners which follow our formal meetings offer members the opportunity to enjoy each others' company in a more relaxed and informal environment. Other reasons put forward during the research for The Future of Freemasonry report include a sense of belonging and structure - which are not always easy to find in today's fragmented society - and a desire to help other people by getting involved in the local community. Most importantly of all though, Freemasonry is all about enjoyment - if members didn't enjoy Freemasonry they would not remain part of the organisation in the way that they do. Susan Moon in Tyne and Wear asks: If the top cop was a Freemason, would he "stretch" the rules if another Freemason broke the law? Nigel Brown: Absolutely not - networking within Freemasonry and trying to use it for personal gain is completely forbidden. Rachel in London asks: Is Freemasonry compatible with humanism? Nigel Brown: The prime qualification for admission into Freemasonry is a belief in a supreme being. Having some form of religious belief is the one thing that all Freemasons have in common, whatever their backgrounds might be. As humanists do not believe in any form of higher power they cannot fulfil that prime qualification. Michael Lashford-Spinks in Gloucestershire asks: I am a retired carver, is Freemasonry linked to craft trades? Nigel Brown: Organised Freemasonry, as we understand it today, began with the formation of the Grand Lodge of England in 1717 - hence our tercentenary celebrations in 2017. While not directly linked, we have taken a lot of our symbolism from stonemasonry. As with stonemasonry, Freemasonry is about moving from level to level as you gain further knowledge and experience, starting with being an apprentice. Would you want to be a Freemason?